Last modified on 17/4/2009 at 11:12:00 AM. Total 6761 views. Its extensive distribution accounts for its current global evaluation as Near-threatened under IUCN (1994) criteria. However, in each country where it occurs, this species has been extensively exploited and populations are becoming more isolated and fragmented. Its global status is currently under review. In Vietnam, this species has been listed as Endangered (Nguyen Duc To Luu & Thomas, 2004) based on the reduction in its habitat and the extent of logging operations. The majority of the remaining mature stands are confined to remote mountainous areas in Lao Cai, Nghe An and Lam Dong Provinces. Licences for felling are still being granted to State Forest Enterprises e.g. in Van Ban District, Lao Cai Province and Muong La District, Son La Province, and illegal logging is also still a problem. 1. 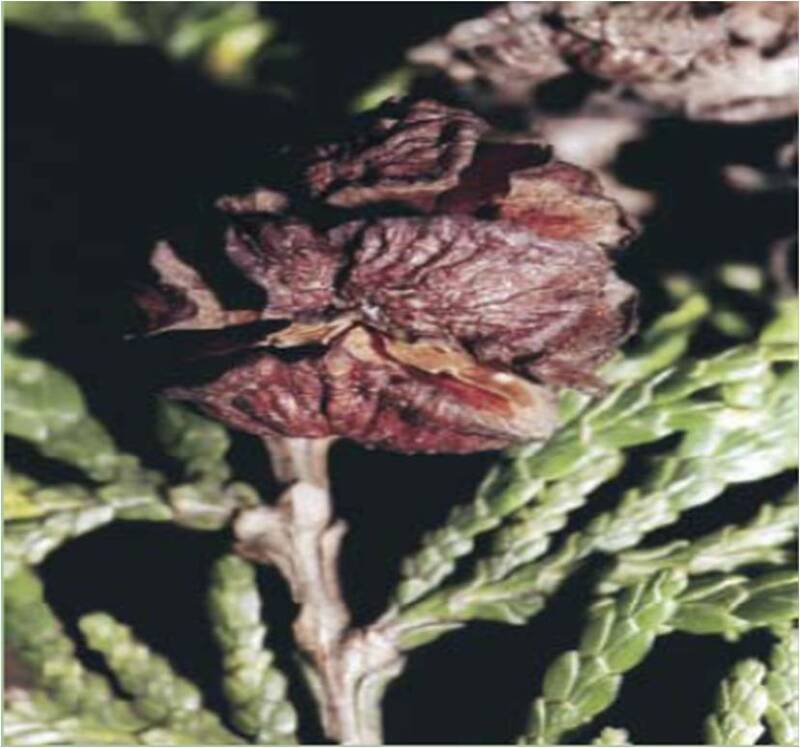 Cone-bearing branchlet with scalelike leaves and seed cones. 3. Branchlet with scalelike leaves, adaxial view. 4-5. Young tree branchlet with scalelike leaves, abaxial view. 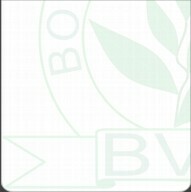 (1-3, 6 drawn from VH 5557, 4-5- from HAL 754 by Pham Van Quang). 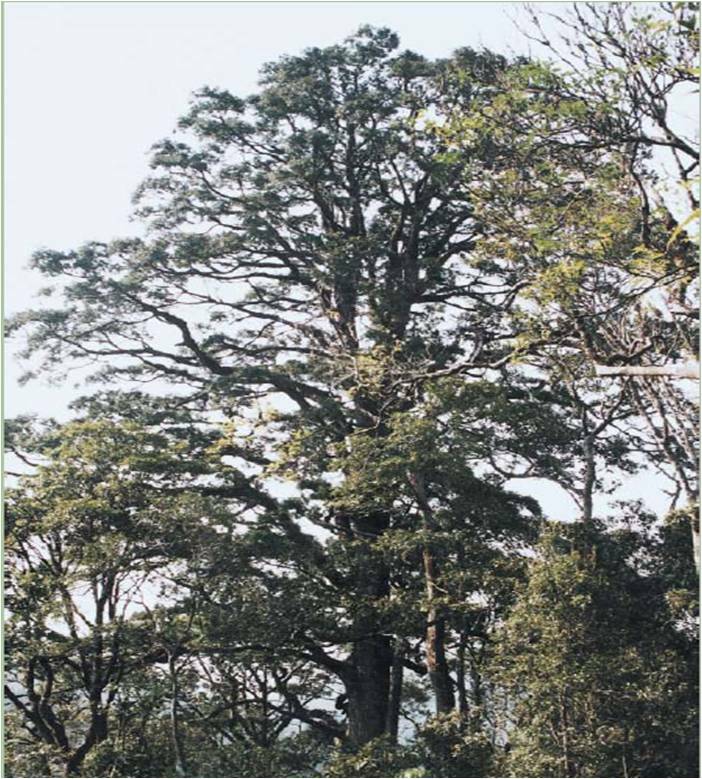 An upright, straight boled tree with rounded crown, reaching up to 30 m high with a dbh to 1.5 or more metres. There is only a single species in this genus, which is remarkably variable in its leaf shapes dependent on the maturity of the tree and its foliage. 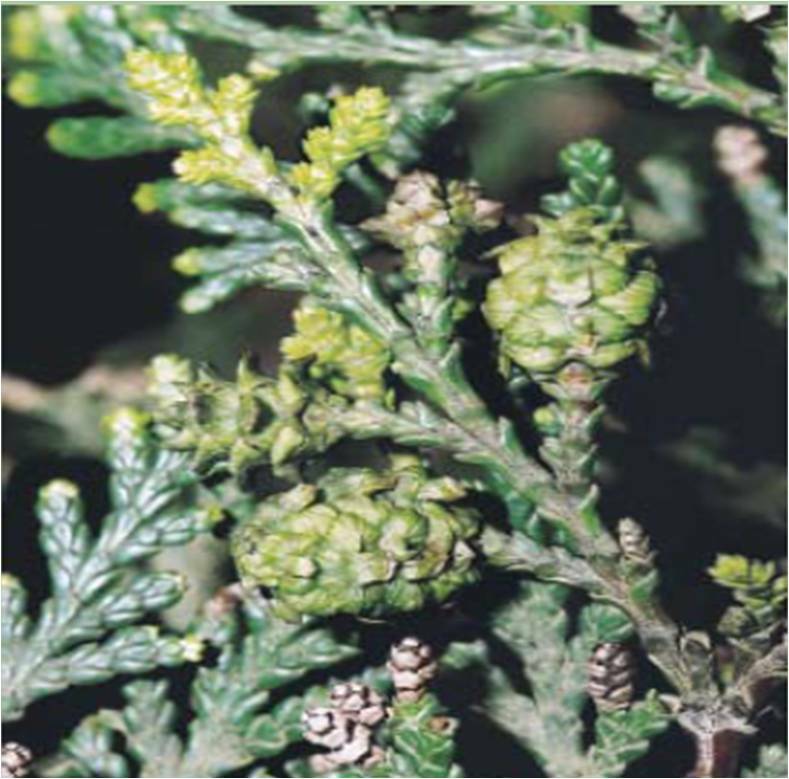 It occurs in nearly pure stands on top ridges of limestone and non-limestone mountains or dispersed as individuals or small groves of trees on slopes and flat areas in primary closed evergreen tropical seasonal broad-leaved submontane and montane forests (mean annual temperature 13-200C, annual rainfall above 1800 mm) dominated by Fagaceae, Lauraceae and Magnoliaceae (Kuznetsov, 2001). 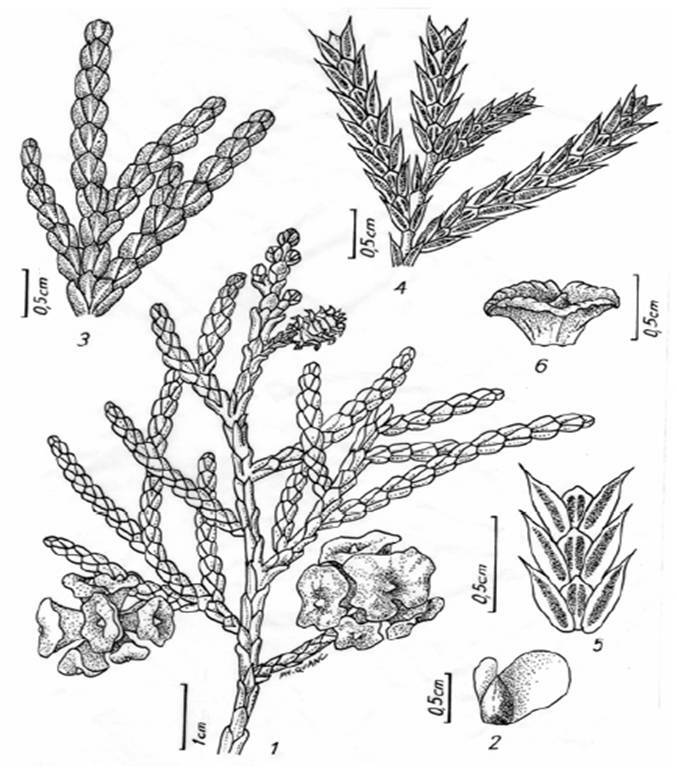 In the southern provinces it is associated with Dacrydium elatum, Pinus dalatensis and P. krempfii, in the central and northern provinces it is associated with Cunninghamia konishii, Taiwania cryptomerioides, and Pinus kwangtungensis. In limestone areas of northern Vietnam (Ha Giang, Bac Can and Hoa Binh Provinces) it is found sometimes in pure stands on top ridges of limestone mountains at the elevation of 900-1400 m amsl. It regenerates abundantly, but is shade intolerant and requires gaps. Within Vietnam it is found in Dien Bien, Lai Chau, Lao Cai, Son La, Yen Bai, Ha Giang, Bac Can, Phu Tho, Hoa Binh, Nghe An, Ha Tinh, Thua Thien-Hue, Kon Tum, Gia Lai, Dac Lac, Lam Dong, Ninh Thuan and Khanh Hoa. Reports from Tuyen Quang need to be verified. Outside of Vietnam it is found across much of southern China and in Laos. In both of these countries the extent of the remaining stands are unknown, making it difficult to estimate the extent of the global populations represented in Vietnam. It produces high quality timber that is used for house building (including roofing shingles), for furniture and handcrafts. It is also a source of valuable essential oil. Seeds have been reported to have medicinal properties (Perry, 1980). The timber is highly valued and consequently it has been intensively exploited. Large trees are becoming rare due to selective felling. Large quotas are still being licensed for cutting in some provinces. The ecology of the species is not well known. If it is dependent on episodal disturbance events followed by large-scale regeneration (the fact that it does here and there occur in groves seems to confirm this), then selective cutting is likely to favour angiosperms, which by quickly filling the gaps will prevent the more light demanding conifers from successfully regenerating. Smaller existing trees are likely to be felled in a next quorum harvest, once they are bigger. This scenario, if correct, would effectively remove Fokienia even from forests that would be otherwise protected (Farjon, 2002). 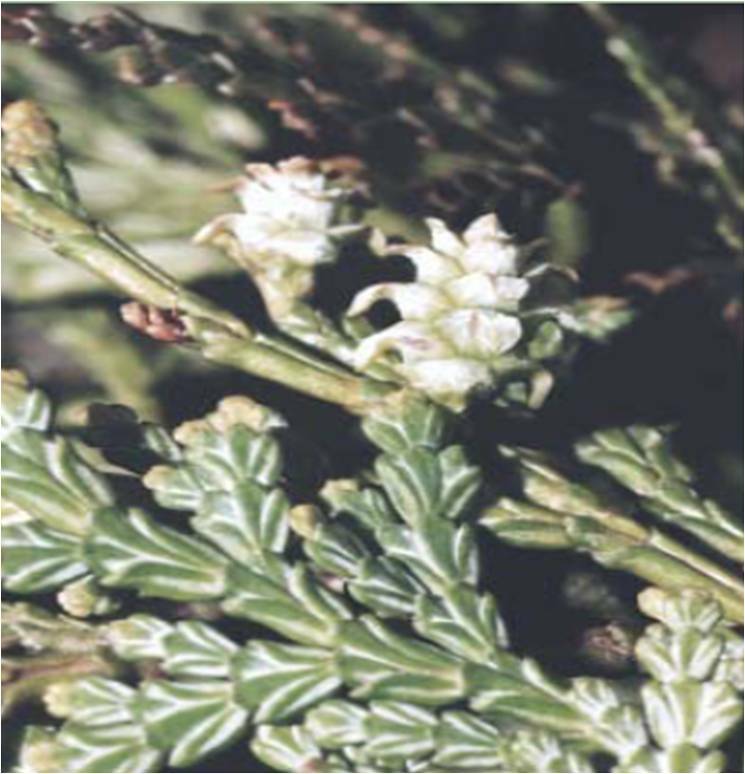 Fokienia hodginsii is listed in the List of Rare and Precious Flora and Fauna in Group IIA for limited exploitation. 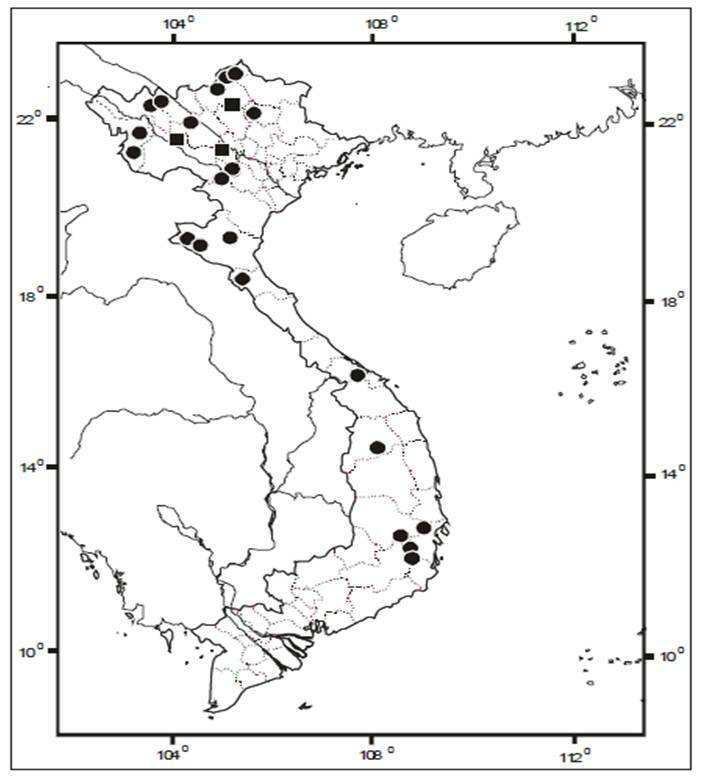 Surveys for volume and area of the species have been done by FIPI (Phung Tu Boi, 1996) in 9 provinces. Two natural stands in Ky Son, Nghe An Province and Van Ban, Lao Cai Province have been registered as National Seed Sources. In some areas, (Ky Son, Nghe An, Van Ban, Lao Cai), large trial plantations are being established with some success but there is a gap between trade related demand and wood availability from plantations in the short term. It is recommended that strict reserves, e.g. within the Hoang Lien Mountain Ecosystem and its forest protection areas, be created in which the various distribution patterns, age classes (including “over mature” or senescent phases if possible) are represented. 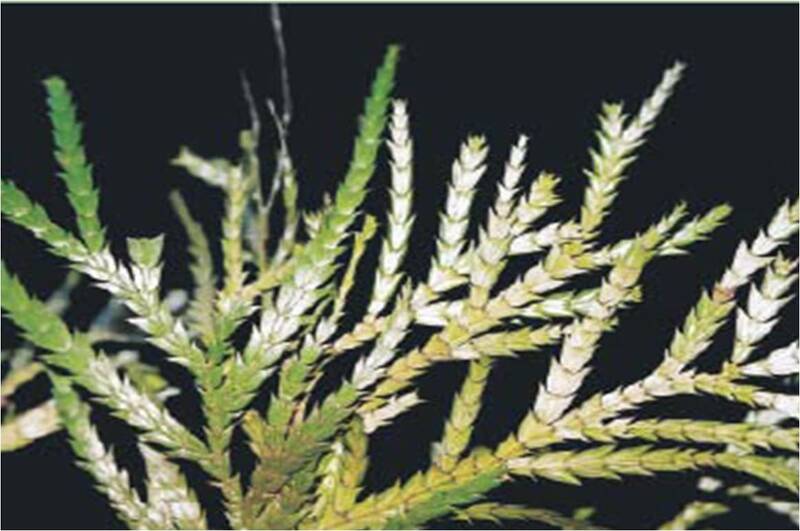 Simultaneously, regeneration of Fokienia (whether or not this occurs) in exploited forest should be monitored. • Continue reviewing published information that has benefit for the implementation of the management plan. 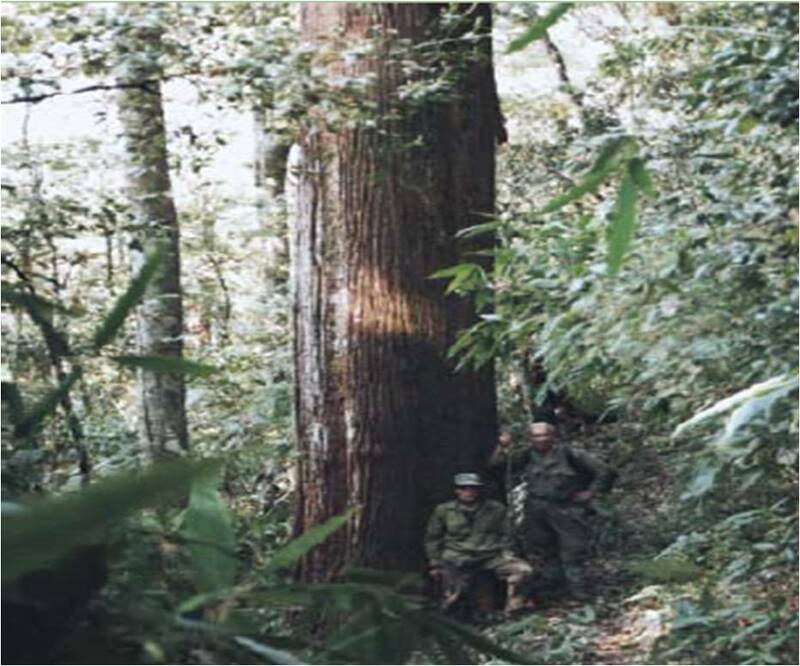 • Assessing trade statistics, where possible, of Fokienia through logging companies and/or processing companies. This may involve the sub-contracting of consultants or researchers outside of Vietnam. • Conducting detailed research into the ecology and regeneration strategy of Fokienia using the Hoang Lien National Park and/or Van Ban District, Lao Cai Province as pilot studies. A pilot study for Fokienia found on limestone parent rock should also be conducted. • Conducting (or contracting) research into the association between Fokienia and the Beautiful Nuthatch Sitta formosa. Positive association would have an impact on the conservation of both taxa and potentially provide further resources of funding. Research would have to be undertaken in suitable areas particularly where the ranges of both species overlap. • Assessing the volume of Fokienia (standing) wood through the use of remote sensing and ground truthing techniques. • Reviewing all data (where possible) of provincial authorities with regards Fokienia distribution, density and harvesting quotas. • Based on the site specific results devise a plan for the management of Fokienia for the whole of Vietnam. • Assess the use of plantation strategies with regards timber trade and the effects of such strategies on both in situ and ex situ conservation of Fokienia. • Assess the use of Fokienia by different ethnic groups for subsistence and cultural purposes. In addition full protection for Fokienia should be given in watershed protection areas – including revoking of current licences for State Forest Enterprises to harvest from natural forest areas. Ex situ gene conservation areas of all provenances should be established. Silvicultural trials for domestication should be undertaken both for large scale commercial production and for local requirements for ethnic minorities and for furniture/craft based small/medium size enterprise development.